July in South Florida means a couple of different things, heat, humidity and Mangoes. Lots of Mangoes. This year is a bumper crop. I am philosophizing the rainy winter produced many flowers followed by many fruits. Followed by many baskets of Mangoes, which I find irresistible. These are Haden Mangoes, from my neighbor the chef, who I suspect just eats his mangoes. I ate some of them, but my husband is not a big fan of plain and won’t eat them straight. So, I made a Mango Amaretto Cake. Not very pretty, but delicious. Last year my Mango effort included a Mango Rum Cake which I believe lasted longer due to its higher alcohol content. Something to consider if your household is not highly populated. After a few servings of the Mango Amaretto cake, I decided to take a more savory adventure with Mango Salsa for grilled fish (Pacific Swordfish in this case). The salsa is made with mango, red bell peppers, sliced green onions, cilantro, lime juice and honey. Great stuff, and I still had some leftover to have with my Blueberry Bread from my lasr fruit overload and vanilla yogurt. Just when my Mango supply dwindled to this another basket was left on my front porch. What to do? Bake some Mango Pecan Bread, of course. I used the same recipe as my Blueberry Pecan Bread and it turned out fine. This is not particularly sweet for a quick fruit bread but the resinous quality of the mango shines through. On to my next culinary adventure in mangoland. Another neighbor gave me some Speckled Perch, a local freshwater fish. So, here it is – pan sauteed Perch in lemon butter sauce with Mango Tomato Sauce served with Parmesan Herb Rice and Sauteed Mixed Veg. Still have Mangoes. The only thing left to do is make granita. It can be eaten straight up, with vanilla ice cream, yogurt or vodka if you are feeling frisky. The remains of the day and this is all I have left! If Tabebuia is the harbinger of spring in South Florida, then The Royal Ponciana (or Flamboyant Tree) is the harbinger of summer and the rainy season. I prefer not to use the H word in regards to seasons. I have heard people refer to these trees as Flamboyants, and I always have to stop and think about what that is for a minute. They are pretty flamboyant. 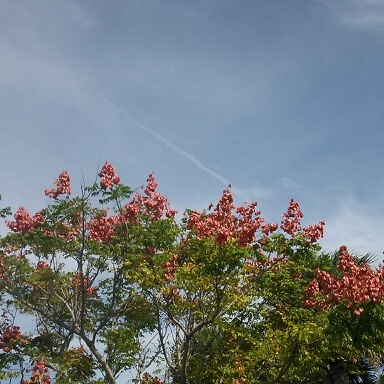 I think the trees look as if they are covered in sprays of red orchids. Ponciana starts blooming in May and then continue into Summer the leaves seem to follow the flowers and are ferny, deep green and eventually cover the tree with a fine textured foliage providing shade for the sun weary Floridian. The floral display is followed by large pods like beans (this is a member of the bean family) In some Caribbean countries, Poncianas are called “Woman’s Tongue” because the pods rattle in the wind. A native of Madagascar and India these trees are planted the world over in the tropics for their fine floral display. Named for M. DePoinci, a governor of the French West Indies in the 1700’s, the Ponciana is celebrated with a Fiesta and a Festival in Miami around the first week of June. These trees lend a tropical flair to any landscape and eventually take on an umbrella form reminiscent of trees in the African savanna. There are numerous Poncianas in my area. Of course, most of the horticultural literature I have seen says they shouldn’t grow here. Generally, I see 10B as the hardiness zone limit, I am pretty sure this is 10A – the coastal area of Martin County. Gardening friends in Vero Beach report Ponciana do not do as well there and I have heard that Ft. Pierce is their northern limit. The lady down the street who is a great gardener advised throwing all the books away and just giving things a try. A reasonable suggestion. These trees should be placed in the sun and are not for the faint of heart. Fast growing and with the potential of attaining a size of 40 by 40 feet, they need some room to spread and also produce a deep shade that it is difficult to grow anything under. They are semi-deciduous; so if you are a Snowbird tired of raking leaves this tree is not for you. The pods also are pretty messy. I got in touch with my inner Southern Belle at Christmas by spray painting some Ponciana pods silver and using them as a front door decoration along with preserved Cabbage Palm fronds.. 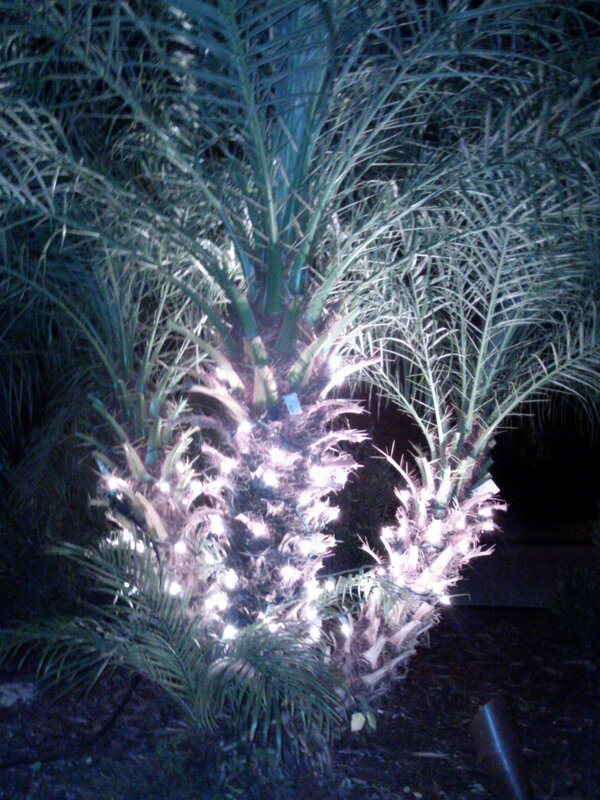 I had a Pygmy Date Palm installed last year in front of my house. 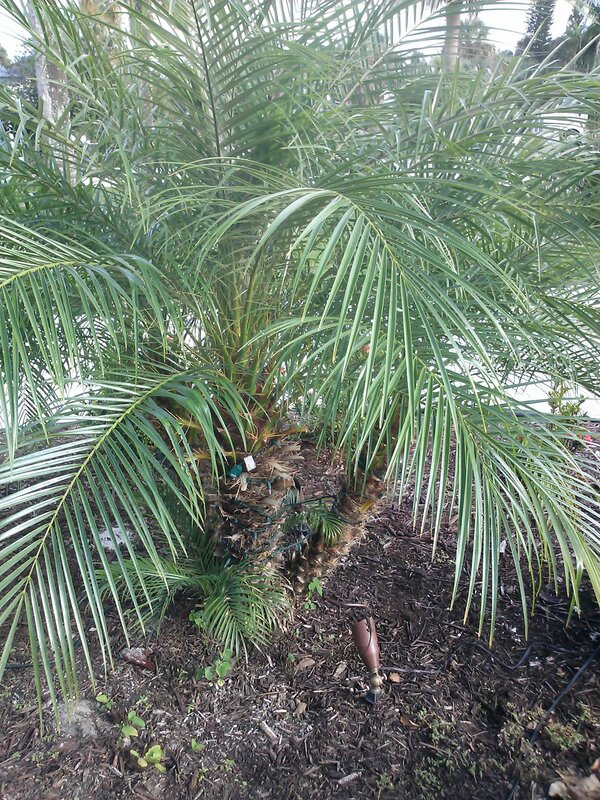 This is a dwarf palm rarely exceeding 10 feet in height and it looks great in front of my bathroom window. I selected a triple trunk palm to accent the house and landscape because as the largest element in the foundation planting it needed some mass. These palms are native to Southeast Asia and are common in South Florida. They actually do bear dates, but a male and female plant is required. I am perfectly happy without dates. Dates have always reminded me of roaches and I just don’t like to eat them. I let the palm grow for about a year before attempting to prune it. Pruning done right reveals a trunk that resembles neatly stacked rows of whole wheat crackers- I have heard these called Triscuit Trees. What is not mentioned is the enormous spines at the base of the palm fronds. The spines are up to two inches long. Somewhere in a jungle I think Pygmies used these for poison darts. Later in the week I was talking to a physician, these palms are well known to the medical community due to the thorns. Wounds from the thorns tend to fester and cause infection. While getting into the holiday spirit I decided to wrap the trunks with miniature white lights. It would have been wise to drink some spirits and don opera length leather gloves before attempting this. As I was decorating I was skewered through the hand and the thorn hit a vein; I now have a 3 inch bruise on my hand that looks terrible. Then I got stabbed in the head and decided to stop for a moment and go in the house. It took a while to get the thorn out of my hand and the bleeding from my head wound staunched. Duly anointed with antibiotic ointment, I persevered and completed my light display, then waited for darkness. The thing I can’t come to terms with is the lack of Japanese Maples. 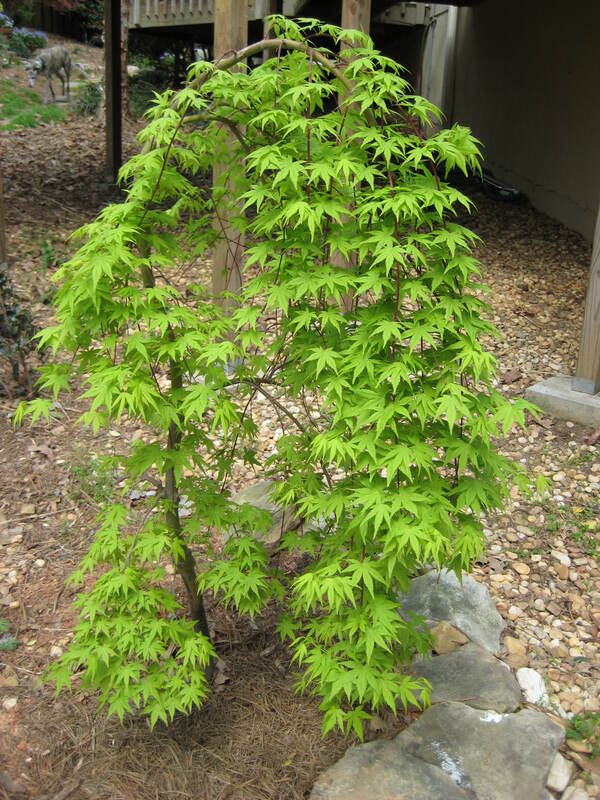 When I first married, we lived in urban townhouse, there was a seedling Japanese Maple in a weasley back garden. Weasley is the operative word. 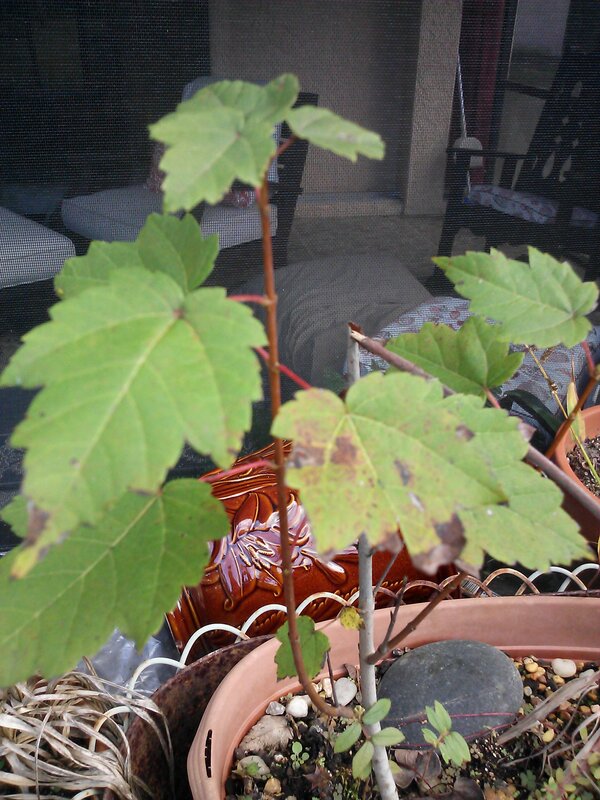 This Maple had a spectacular fall color and when we moved to a bigger house I took a seedling with me. This Maple grew to 10 or 12 feet tall over a period of 17 years and is one of my all time favorite trees. 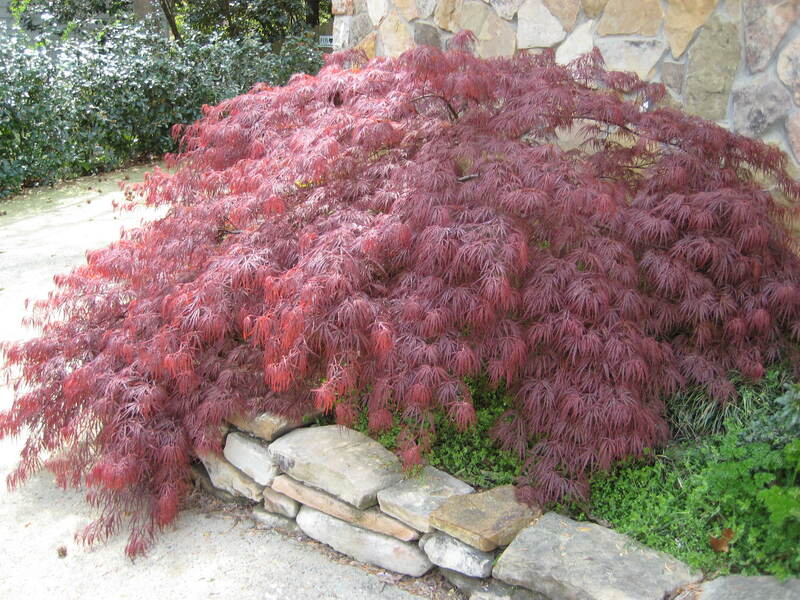 The above Japanese Maples are from my former garden, a ‘Best Red’ and the Green is ‘Ryusen’. When we moved to South Florida I decided to chance it and dug up a seedling and carted it down here only to find out it was a Red Maple! Bah! Undeterred by my lack of Japanese Maple I decided to buy and prune into tree form a ‘Raggedy Ann’ Copperleaf. 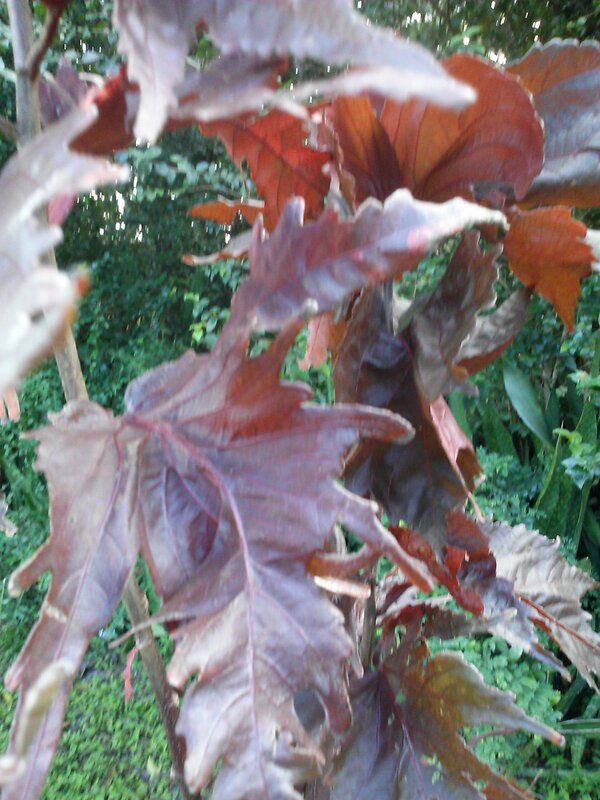 This is a burgundy and red tropical shrub with raggedy edged foliage kind of like a Dissectum Maple. Raggedy Ann turns out to be uncooperative and less than graceful. The tree form pruning attempt produced an ungainly shrub 5 feet tall with 5 stems, with perhaps a width of 10 inches. However, the color is pretty good. This is my husband’s favorite tree; possibly the only tree he ever really focused on. The ornamental, exfoliating bark is the main feature of this tree. 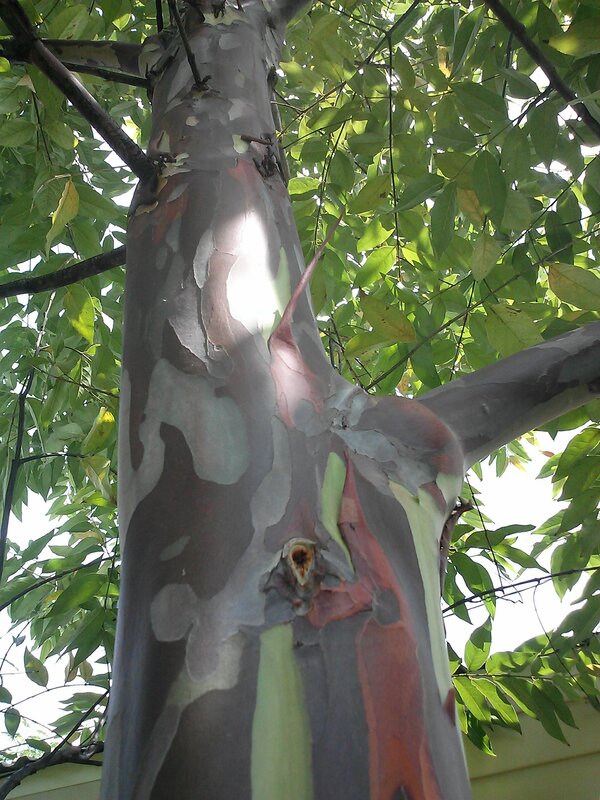 Native to the Phillipines and surrounding islands, it is sometimes called the Mindanao Gum tree. The tree provides most of the pulpwood for paper and is grown on plantations in the Phillipines. We first ran across this tree and its spectacular bark on the road to Hana in Maui, Hawaii. 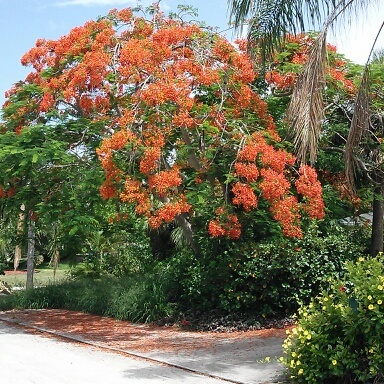 Intrigued by the tree, I researched it and was interested to find that it can be grown in South Florida. The tree is not tolerant of frost and our average low is 40 degrees. It is sited in a protected area, but is getting pretty tall. And grow it does. I bought this tree in November 2012 at a plant sale in West Palm Beach at Mounts Botanical Garden. It was run over with a Riding lawn mower shortly after being planted and smashed flat. This resulted in two scrapes down the entire length of the trunk. Eschewing arboricultural reason, I decided to try and save the tree rather than buy another one. I went to Home Depot and bought a tree staking kit, cleaned its wounds, took out the damaged bark and wrapped the trunk with tree wrap and staked the tree until it healed. A few months later the bark had calloused and the tree was off to the races. Currently, nearly two years later and overwhelmingly robust I would estimate the tree is 30 feet tall. It doubled in size in one year (it was 5-6 feet tall when I bought it!) and has grown 18 feet in the past year. Now I am a little afraid. 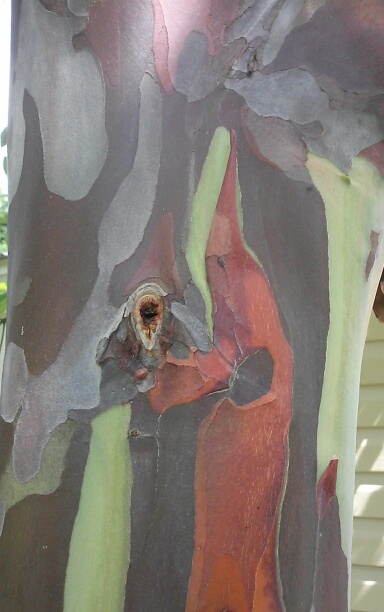 The bark is currently not showing any purple or blue, but I believe it will. The new growth is red and it flowers in summer, not terribly exciting flowers, little white panicles – fortunately, no fruit thus far. The bark is the star of the show. Happy Fourth from my garden in South Florida! 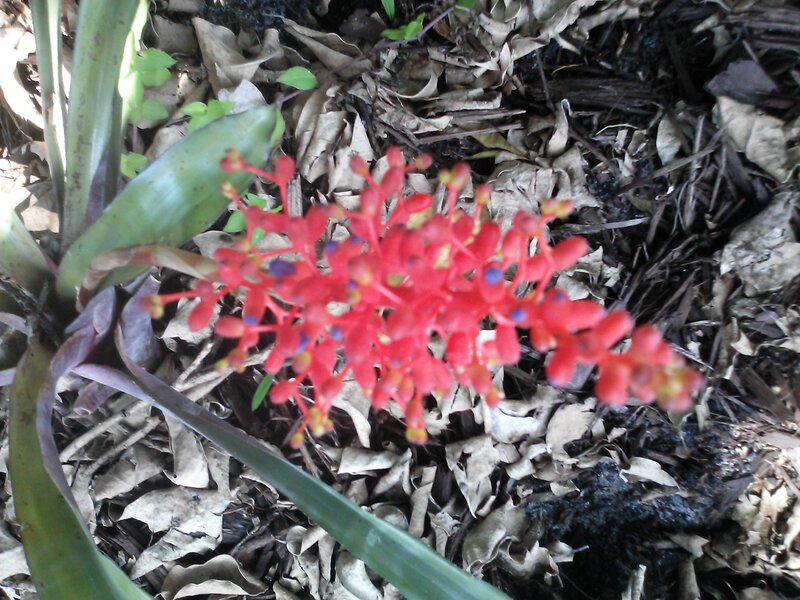 The red is a Miniata Bromeliad-Aechmea miniata, this bromeliad is reported to bloom at any time of the year, in my garden it blooms in summer. 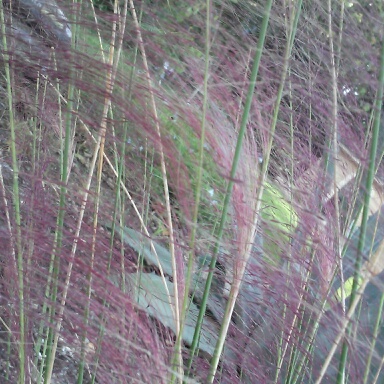 A reliable perennial south of Orlando, the backs of the leaves are grey mottled and shiny green on top. Foliage is not too sharp for a bromeliad and they seem to double in quantity every year. 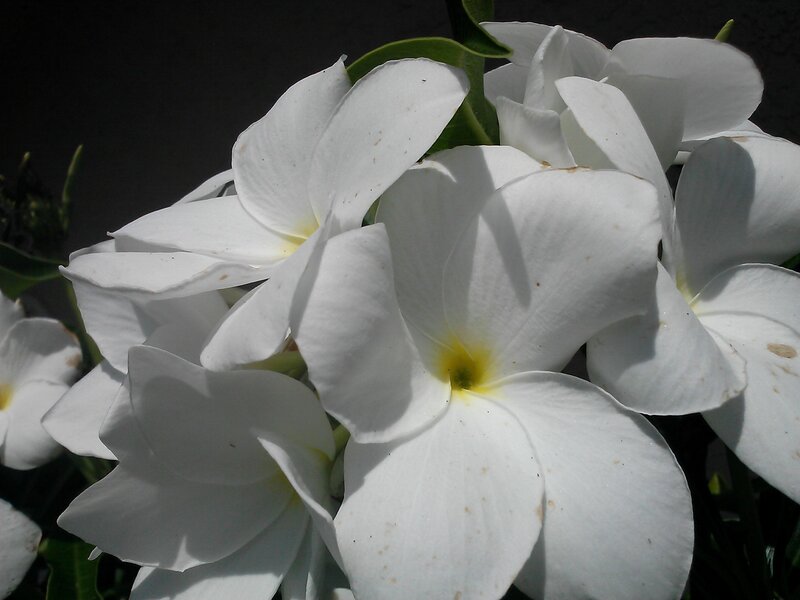 The white is Bridal Bouquet Plumeria-Plumeria pudica. An evergreen Plumeria that is not fragrant but flowers on and off through the rainy season. The name is apt, it would make a nice bridal bouquet. 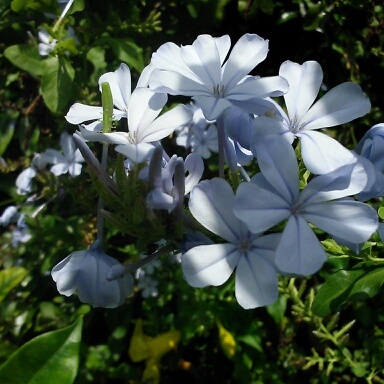 The blue is Plumbago – Plumbago auriculata. I think of this as the Mophead Hydrangea of the tropics. Reliable blue flowers primarily in the rainy season this is sort of a creeping shrub. And sort of indestructible, a good thing. I hadn’t considered a patriotic planting for the Fourth, but I got one.